Today was my first visit with new preschool and pre-k students! I love the first class with a new group, although it can be a little nerve racking not knowing their names or the temperaments before going into it. However, the excitement in their eyes and their willingness to play and dance settles all that. We did the warm-up, we read the polar bear story, we played the polar bear cube game, we did our polar bear jumps, and had a dance party; it's amazing how much can fit into 30 minutes! One of the polar bear cub movements on the cube is "curl." 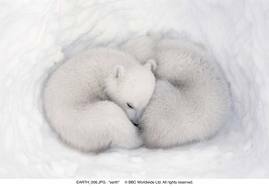 The photograph is of two polar bear cubs snuggled up in the snow. So, to end the cube game, I had all the kids curl up like the cubs - then I covered them in the "snow and ice" which, of course, was yards and yards of white and blue tulle- I could've just covered the kids in fabric for the whole half hour and they probably would've been just as happy! Anyway that you can work fabric into your class - go for it! Floors do get slippery with fabric though, so be warned, but the fabric has a way of igniting imaginations through a tactile experience that young children love. For today's story dance class, we explored polar bear movement using fabric and a movement cube. We did our usual warm-up and then, instead of passing out the story squares, I laid out blue and white fabric and tulle. 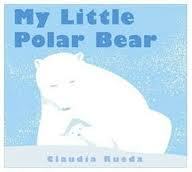 The children snuggled up on the "snow and ice" as we read My Little Polar Bear by Claudia Rueda. The story is simple and sweet. It is guided by the cub's curiosity to his mother about being a polar bear and we get to find out what polar bears like to do. These same and other cub movements are reflected on my polar bear movement cube. This was constructed from a cube shaped tissue box, construction paper, and six polar bear movements I got from the Clifford magazine by Scholastic. I covered the tissue box with blue construction paper, then put a polar bear cub movement photograph with simple text, on each side. Each movement is labeled with a number and a sentence with a key word in it. We reviewed each of the six movements then started the game. Each student took a turn to roll the cube into the "snow and ice," which I placed in the center of our circle. We acted out the movements each person rolled. Then I removed the fabric and let students explore these movements in free space as I narrated. I ended this guided imagery with everyone "curled" up (movement #6) and covered them with the fabric. This was their delight! Children love fabric, it can become anything. The children enjoyed playing under the fabric and acting like polar bear cubs in the snow. It was great. Next, students lined-up for polar bear jumps. The white fabric acted as the snow pile, students jumped over it one at a time to the Nutcracker while I hit the tambourine. Today's book invited a great movement class. I was looking for a winter or snow themed book when I came across the polar bear book and it all came together. I remembered I had a polar bear movement cube and when I couldn't find it - I made another one! Movement cubes are great classroom tools. You can make them about anything and connect language and movement to pretty much any theme, you just need to get a little creative. This week's story dance class with the preschoolers was super fun. 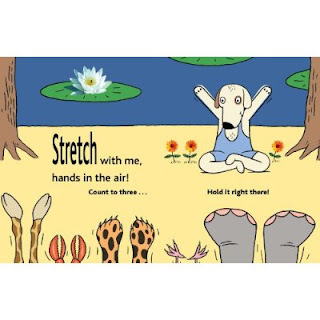 We read Stretch by Doreen Cronin and Scott Menchin (also in book recommendations!). After our warm-up and snake breaths we get ready for the story. I pass out the story squares and as I do, the children name all the colors. Then I review the book cover with them. The first story dance group made spontaneous predictions about what animals they thought would be in the story. It was great. Sadly, the crocodile one child predicted did not appear in the story, but he did not seem disappointed by the giraffe, whale, leopard, and kitten who did. After the story, I put on some mid-tempo music and led the group in a story square stretch. I ask them to hold the squares with two hands and stretch the square up, to each side, lunging, we stretched them out front and behind, we shined our shoes with them. Next, I collected the squares and asked the children to sit down for I was bringing out my faithful sidekick - Mr.Tambourine. I went around the circle and had each student tap Mr. Tambourine with their toes. This was a really cute exercise that they all seemed to get a kick out of- ha! I think some of them may have thought the notion of being asked to kick the tambourine with their feet was absolutely absurd. It is a funny idea considering if they were to go around kicking tambourines, that would definitely not be ok. It is ok, however, in a structured class as this. The tambourine provided them a focal point to aim, stretch, and tap. The tambourine was a target, and when they toe-tapped the target, they created a really cool sound. This invites an auditory experience along with the kinetic and I like multi-model, or inter-model, experiences in the learning process. This type of exercise is beneficial for developing self-awareness by exploring their bodies in space - My body ends here, CLANG! (or whatever sound it makes). It also helps to develop self-awareness through force; when the student kicks lightly, one kind of sound occurs. When they kick hard, another and more startling sound occurs. This is very valuable information for the developing brain. My tambourine is also super durable and I use it regularly when teaching dance, movement, and drama, so I wasn't worried about them kicking it. For our dance party, I passed out the dance scarves and encouraged students to use the scarves in different ways, incorporate some of the stretch moves we had previously done, and - the best part - throw the scarves up in the air! For this part of class, I put on Groove Armada's If Everybody Looked the Same from the album Vertigo. This song is really up-beat and has a funky groove that they can all get down to. The only lyric in the song is, "If everybody looked the same, we'd get tired of looking at each other." I believe this is a great message in general and totally coincides with my teaching philosophies of acceptance/tolerance/and celebrating diversity. From my years of doing this, I have also learned that little kids really love disco. This song is not disco necessarily, but this song has similar elements that the kids like to boogie down to. After all, we can't listen to Stayin' Alive every week! The kindergarten and pre-k classes did in fact enjoy the masks. They were a little too big, but we rolled with it. The kids thought they were silly and fun. I would read them a page from the book Peaceful Piggy Yoga by Kerry Lee Maclean (also in book recommendations! ), then talk about the peaceful piggy in the illustration. I brought different props to go along with each piggy character. Two students would come up and become those "peaceful piggies" and demonstrate the pose for the class. The format worked really great, especially for the smaller pre-k group. For the larger kindergarten class, we only had time for half of the book; I will do the second half of the book during our next class. I brought back the ukulele and did Yoga Freeze Dance for our dance party. I encouraged the students to incorporate movements of the different characters and poses we had explored in the book. The end of class dance party varies each week. Sometimes we freestyle, sometimes we freeze dance with special poses, sometimes we play Magic Soup. The rules of the dance party may change, but I always leave time for the dance party; it wouldn't be story story dance without it! I have not yet done peaceful piggies with the preschoolers. I think the format will have to be a little different and more contained. I think I will leave out the masks, but use the character props, and have everyone pretend to be peaceful piggies. I am pretty sure this group will be able to get into piggy character without the assistance of a mask. I'm still exploring ideas for this one. I am also looking forward to the second half of Peaceful Piggies with the pre-k and kindergarten. They all seemed to enjoy taking turns being different characters and getting-up in front of the group. Its days like these that I feel so grateful to do what I do. I get to witness and experience these great moments and when they happen, all I can do is smile and fill-up with joy because I was there. Today's story dance class was with the preschoolers. I read Eric Carle's From Head to Toe (also in book recommendations) As I read along, the little ones tried out the different moves in the story. After the story, I invited each student up one at at time. They could turn into anything they wanted and had to share a movement for the class. Then I would introduce them in the style of the book, "This is Princess Samantha and she can twirl. Can you?" Then everyone would twirl. Essentially, it is a mirroring game and they were super cute doing it. We had three firefighters, but one of the fire fighters was a hip-hopping firefighter (this was painfully cute, this kid was getting down!). We also had a student who was a pumpkin that flapped up and down and made a silly noise, and there was also a very deliberate kitty cat that was more like a robot - this kid was committed to his sound and movement like I'd never seen. After everyone got a turn, I put on Groove Armada, and we had a dance party. I invited the kids to incorporate moves from the book and moves of their friends. It was a pretty great class for everyone. The children's responses certainly had the teachers in smiles and all the kids moving. It was a joy!